Using mutual fund, you may be able to reduce the risk of investing in growth stock. Some research also has shown a focused growth stock funds may outperform other classes of funds such as value stock funds or blend stock fund. The top performer list includes Reynolds Blue Chip Growth, Brown Capital Management Small Company, Wells Fargo Advantage Growth, etc. These growth stock funds usually focus on capital appreciation. There is usually very little or no dividend that is distributed by these growth funds. Investing in mutual funds also can provide less risk hence the portfolio is diversified with variety of growth stocks. The following top performer funds list has been compiled by sorting through its performance for the past 5 years. Most of these growth equity funds are also rated among the best in their category. I have provided each of these top performing fund review such as initial investment requirement, fund manager, its performance, sales load, expense ratio, risk, top sectors, rating, top holdings, etc. The top performer funds include three categories: large growth, mid-cap growth, and small growth. Most of the assets are invested in US companies stocks. The Reynolds Blue Chip Growth fund seeks long term appreciation of capital. The fund mainly invests in growth companies equity securities with >$1 billion market capitalization. This large growth stock fund may invest in stocks of both domestic and foreign “blue chip” companies. The growth mutual fund returned 12.45% over the last five year period. The growth mutual fund has an expense ratio of 1.55% compared to a category average of 1.28%. This top fund is rated with 4 stars rating by Morningstar. The top assets allocation is 89.18% in U.S. Stock. The fund’s manager is Frederick L. Reynolds. The Brown Capital Management Small Company fund focuses on buying common stocks of firms with total operating revenues of $250 million or less at the time of initial investment. The fund’s total net assets are $1.4 Billion. There is no sales load. This best fund is limited to new investor. This small growth mutual fund returned 8.56% over the last one year period. Robert E. Hall, Keith A. Lee, Kempton Ingersoll, and Amy Y. Zhang are the fund managers. 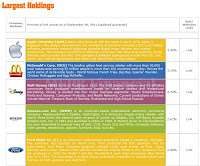 The top 3 stocks holdings as of February 2012 are: Gen-Probe Inc, Tyler Technologies Inc, and Cognex Corp. Morningstar Analyst has rated this fund with Gold Rating. Wells Fargo Advantage Growth fund invests the majority of its assets in large companies with good prospects for robust and sustainable growth of revenues and earnings. The fund selects equity securities of companies of all market capitalizations. It may also invest in equity securities of foreign issuers through ADRs and similar investments. The lead manager is Thomas Ognar. The growth mutual fund has a year annualized returned of 12.17%. This fund is rated with 5 stars rating. This Brown Capital Management Mid-Cap fund seeks capital growth over the long term. The fund utilized its assets to invest in equity securities of mid cap companies. This BCMSX fund mainly invests in common stocks, but may also invest in preferred stocks, convertible bonds, and warrants. It uses the Russell Midcap Growth Index as its benchmark for investment. The growth mutual fund returned 3.13% over the last one year period. As of February 2012, the top 5 stocks are Trimble Navigation Ltd, Quanta Services Inc, PAREXEL International Corp, FEI Co, and Shire PLC. This mid cap growth fund has a 5 star rating by Morningstar. The total net assets are $33.2 million. The dividend yield is 0%. The Marsico Flexible Capital fund focuses its investment in long-term growth equity securities. This MFCFX fund may invest in issuers of any size throughout the world. It usually holds a core position of between 20 and 50 securities or other investments. It may also invest in various types of fixed income and variable income securities (including below investment grade). The fund is managed by A. Douglas Rao since 2007. It currently has a dividend yield of 0.42%. 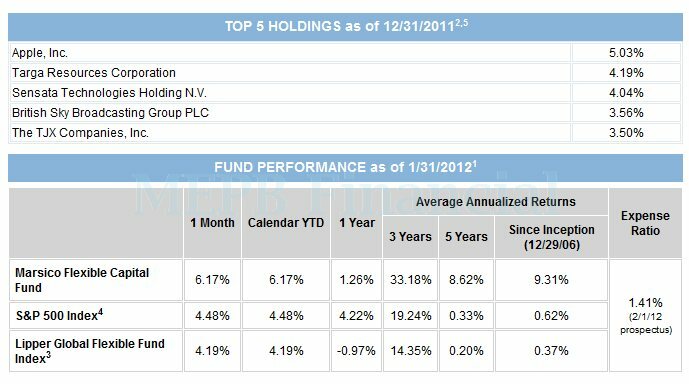 This top performer mutual fund is open to new investors. Investors can buy this fund with $2,500 initial funding from 66 brokerages. As of January 2012, the top 3 sectors are: Technology, Consumer Cyclical, and Financial Services. The top 3 stocks are Apple Inc, Targa Resources Corp, and Sensata Technologies Holding B.V. This Integrity Williston Basin/Mid-North America Stock A (ICPAX) invests mainly in domestic and foreign stocks that are participating in the Willis ton Basin area and/or Mid-North America area. This mid-cap growth stock fund has a 3 star rating by Morningstar. The annual turnover rate is 35.4%. The front end sales load is 5% and the expense ratio fee is 1.5%. The fund’s top 5 holdings are Kodiak Oil & Gas Corp, National Oilwell Varco Inc, Oasis Petroleum Inc, Hess Corp, and Carbo Ceramics Inc.
Monetta Young Investor fund’s objective is to achieve the long-term capital growth. This large growth fund invests about 50% of its assets in low cost ETF’s or other funds tracking S&P 500 index. The remaining assets are invested in common stocks of companies of all market capitalization ranges and are diversified among industries and market sectors. The total net assets are $25 million. You can invest with $1,000 initial balance. It also received 5 stars rating. The fund’s managers are Robert S. Bacarella and Robert J. Bacarella. 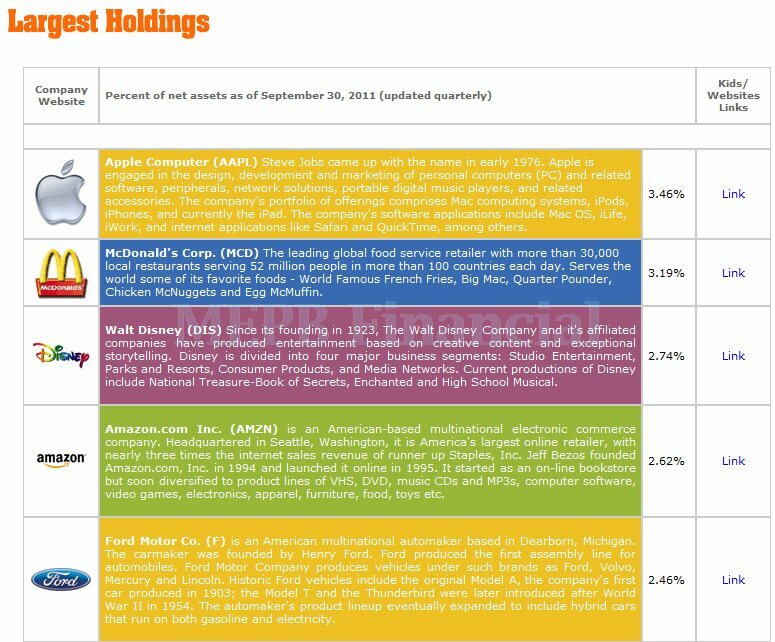 The top 5 holdings are: iShares S&P 500 Index, SPDR S&P 500, Vanguard Value ETF, Vanguard S&P 500 ETF, and Vanguard Large Cap ETF. This Eaton Vance Atlanta Capital SMID-Cap A (EAASX) uses most of its assets to purchase small to mid-sized market capitalization companies. This mid cap growth mutual fund has returned 8.17% over the past 1 year, 26.09 over the past 3 year, and 8.44% over the past 5 year. Investor can buy this fund from 92 brokerages such as TD Ameritrade, JPMorgan, Merrill Lynch, Fidelity, etc. The investment objective of Rydex S&P MidCap 400 Pure Growth fund is to track the performance of the S&P MidCap 400 Pure Growth Index. It invests majority of its assets in companies stocks in the index. There is no dividend yield (i.e. yield is 0%). The fund has an expense fee of 1.54%. The Janus Triton seeks to provide long-term capital growth. The fund invests mainly in common stocks selected for their growth potential especially equity securities of small- and medium-sized companies (market cap < $10 billion). The fund may invest in foreign equity, emerging markets, and debt securities. Morningstar has rated this small growth fund with 5 stars rating. The total net assets are $ 2.6 Billion. You can also buy the other classes of this top growth fund such as Class A (JGMAX), Class C (JGMCX), Class D (JANIX), Class I (JSMGX), Class R (JGMRX), Class S (JGMIX), and Class T (JATTX). The top 3 stocks are: SBA Communications Corp, Dresser-Rand Group Inc, and World Fuel Services Corporation.